There comes a time in every homeowner’s life when the walls demand a change. You may be resurfacing them for a number of reasons, such as repairing damage, re-coloring to match new furniture, or simply because you want a change. This inevitably leads to the question of using paint or wallpaper, both of which have their own distinct advantages. Before investing in a particular wall covering, it is a good idea to compare them to ensure you are making the best choice. Paint has been the most popular form of wall covering for decades, although improvements in wallpaper have made it a major competitor in recent years. Paint still retains many advantages, however, and is generally cheaper and easier to apply than wallpaper. If you don’t wish to spend a long time waiting for a room to become usable again, paint is the way to go. Primer takes approximately 24 hours to dry, and you will need on average two to three coats of paint. Drying time for each coat depends on the type of paint you are using and amount of ventilation. On the flip side of the coin, paint is a messy substance which is known to splatter, drip, and betray heavy brush strokes. Recovering a wall is relatively painless when using paint over paint. Again, a primer is required, and the neutral tone of the primer will help when using a dark paint over a light one or vice-versa. In most cases, it only takes a few coats to completely cover the previous color, and there are even some wallpapers available that may be painted over. Stripping paint from woodwork, such as a door frame, for staining is also relatively simple. A good paint job may last 10 to 15 years, but you can change it at any time you desire. While paint no longer contains traces of lead, there are still some environmental concerns. The biggest of these is the risk of VOCs (volatile organic compounds). These harmful substances can be released over time and are harmful to the human body. Be sure to do some research before selecting a specific brand in order to minimize the risk of VOCs. Paint is fairly fragile compared to wallpaper, and it may scratch, chip, or discolor in high-traffic areas. Luckily, repairs are easy and generally consist of adding a touch of paint over the damaged area. By taking a sample chip of the paint to your local paint or hardware store, the color can be matched almost exactly, although some brands will not be a perfect match, even for mixed colors. The color spectrum provided by paint is somewhat limited, although it is available in matte, semi-gloss, and gloss finishes. What makes paint more versatile than wallpaper is that you are able to paint designs. For example, you may decide to paint a tree in your child’s room, with leaves spreading onto the ceiling and grass or other landscaping giving way to a blue sky. Wallpapers with similar patterns may be purchased, but lack the ability for you to make custom themes for video games or other less common topics, as well as limiting color to the walls whereas paint may incorporate the ceiling into your theme. Paint is also useful in areas where moisture is an issue. Bathrooms, for example, tend to be too humid for wallpaper and may lead to mold or other damage, whereas using a good exterior paint means the color will last for some time. Wallpaper was once highly popular and is beginning to see a return to that popularity. It is now more affordable, more durable, and easier to apply than it once was. Modern wallpaper enjoys several advantages over paint, although it also has some disadvantages to consider. Wallpaper is not a project to undertake when you have limited time to prepare a room. 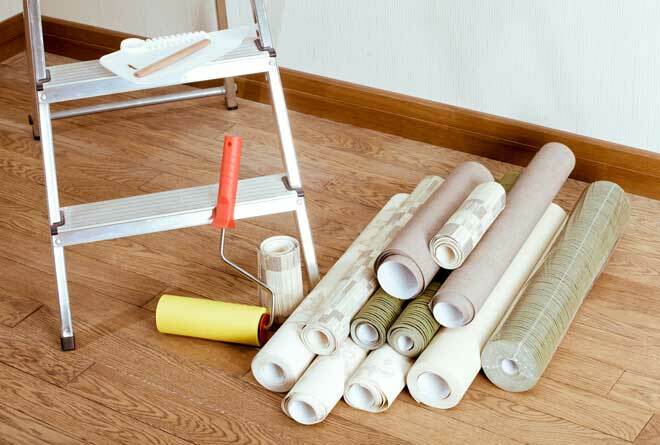 Unlike paint, wallpaper does not require multiple coats. However, wallpaper comes in strips which must be lined up and carefully applied to avoid air bubbles, wrinkles, and other flaws. This can become quite time consuming, and any rips or other damage to a piece you have applied is permanent, requiring you to either replace the strip or attempt to hide the damage. Old wallpaper must be scraped away using stripping tools or other chemical solvents which might damage your wall if you aren’t careful. The wall must also be clean and dry before attempting to paper. Some wallpapers require glue while others have a dry glue backing and must be wet to activate the glue. Applying wallpaper to a painted wall does not require additional preparation unless there are chips or other damage to the paint which will show through. Wallpaper itself poses little environmental risk by itself. However, the chemicals used to remove old wallpaper can be toxic to humans and the environment. Perhaps the biggest downside to wallpaper is the inability to affect simple repairs. In some cases, damage may be repaired by cutting both the damaged section and a matching section from a backup roll. However, even with a perfect fit, the patch may be visible upon examination. Another downside to wallpaper is that damage from nails cannot be easily hidden, so hanging pictures requires more planning. Thankfully, wallpaper tends to be more durable than paint and carries an average lifespan of 15 years barring moisture damage. The largest advantage of wallpaper is the sheer variety of patterns, colors, and textures available. You may choose a specific color, a design incorporating multiple colors, landscapes, basic patterns, textured or glittery deigns… The possibilities are extremely varied. Unfortunately, wallpaper doesn’t fare well in bathrooms or a kitchen that has a lot of moisture, and will fade over time if in a room exposed to excessive sunlight, such as a sunroom. One option which has become very popular is to incorporate both paint and wallpaper into a single room. This is most often the case for special wallpapers such as landscapes or textures, but may even include basic colors. A common example of this is to paint all but one wall of the room and place a landscape on the remaining wall to resemble a mural. 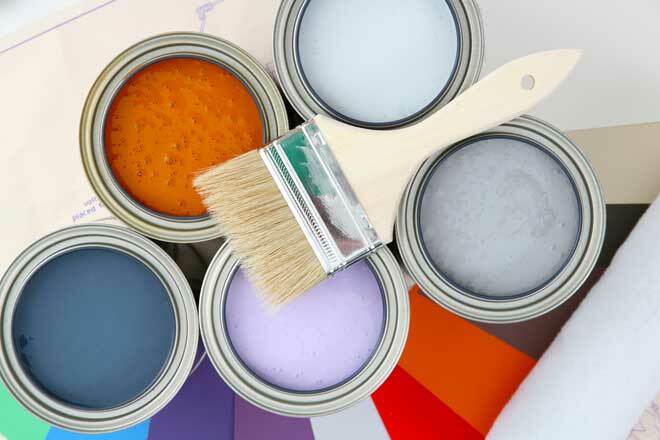 The American Coatings Association website offers guides on choosing paint, as well as news and articles about all things paint related. Sherwin-Williams offers a list of resources concerning VOC regulations and green programs involving paint. While meant to focus on the brand’s own compliance, the information itself encompasses all paint brands.